If Patrick Peterson is on the board when Cleveland picks(6) should we trade up. According to the value chart, pick 6 is worth 1600. Pick 13 is worth 1150 and pick 44 is worth 460. So the question is would you give up a 1st and a 2nd for Patrick Peterson. If I'm in the FO and Cleveland is willing I pull the trigger. I think PP is going to be an elite corner for a long time and a 2nd round pick is a small price to pay. First, I'm not that high on Patrick Peterson - looks good on paper and in shorts, but I'm not all that impressed having watched a number of LSU's games last year. Julio Jones certainly got the better of him. Second, our 2nd round pick is critical. Last two years it was essentially Louis Delmas and Jahvid Best, I don't want to pass on players like that and we need LBs bad and that could be a good spot to grab one. I think Peterson will be a good player, but I'm with Pablo. I wouldn't give up a 1st and 2nd for him. I think Prince is as good, and there is a chance we could land Prince at 13 and very good LB at 44. I think that if we want Prince, we will have to trade up to #8. Prince won't make it past Dallas. And if by some twist of fate that he does make it past Dallas, The Vikes would likely take him. Am I the only one not impressed with Prince? Living down here in Big 12 country, I got to see a few Nebraska games and he didn't do anything that stood out to me. In particular their game vs. OK St. Justin Blackmon was making catches on him all day. Ya I probably wouldnt trade that far to get get Peterson, but what about trading up not as far to get Prince? I keep hearing about this game as people use to question Prince. I watched that game and actually didn't think the cornerback formerly known as Prince played all that badly. Let's examine. First, Blackmon is a beast - 111 receptions, 1700+ yards and 20 TDs this season. People act as though it was Bill Schroder who went off. Blackmon is a potential NFL All-Pro and I think he is a lock top 5 pick in two years. His 5 catches against Nebraska was his lowest of the season and the last one was a TD catch for about 25 yards when Prince wasn't covering him. He did have the huge 80-yard TD for most of his stats, but that was a trick play (flea flicker). Sure Prince bit, but he helps in the run game and it was a great fake by the QB and Blackmon. Take those two plays out and you are talking about 3 catches for about 40-50 yards. I'd take Prince in a heartbeat if he is there when the Lions pick at 13. I'm not a big fan of moving up this year because there is nobody I'm in love with and we only have limited draft picks and need to make the most of them. Your reasoning for not trading up is the very reason I want to trade up. 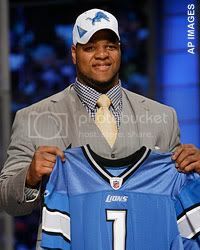 Because there is nobody, except for Prince, that I really like for the Lions in the 1st round. Well, I really like Peterson also. But, there is absolutely ZERO chance we can get him. If we trade down a little, I do like Harris. But, not as much as I like Prince. Any way you slice it, CB is the only position I like for the Lions in the 1st round. The very thought of drafting an OT in the 1st round makes me feel like vomiting. All the OT's stink this year. And it befuddles me how they went from the most pathetic group of OT's in the history of the NFL draft to a very strong group. AFTER the games STOPPED. They are a bunch of Rod Marinelli, workout warrior types. Great practice players. Gametime: NOT SO MUCH. Don't see the Lions trading up. They stay at 13 and take BPA, maybe Cam Jordan, JJ Watt, or somebody that slips through the cracks in the top ten, regardless of position. I'm not high on any of the tackles this year either, at least not in the first round. Having just 5 picks to begin with, packaging two to move up would leave us with a very meager draft haul. With the lack of any real top notch talent in this draft, I don't see any team walking away with more than 2 starters out of it. So, if we could trade up to get Prince and it costs us our 3rd round pick, I am all for it. Then get a Linebacker in the 2nd round. I want to trade all the rest of our picks for future picks to give us some fire power in next years draft. Next years draft is bound to be stronger than this years draft. And we could use that fire power to trade up as high as we need to next year to get our next LT. I believe there is "top notch talent" in this draft. But what we have a need for might not be there at 13. I understand the desire to get a potential #1 corner for the secondary. That being said, he will still be a rookie CB, and I wouldn't expect him to radically improve the corner in the first season. Realistically, the Lions might not get any starters for next season from this years draft. But, the potential to add depth, and possible future starters exists. That's why I feel like they should stay put at 13, or preferably trade back, gather more picks to build the depth that is lacking. I understand your point. We just have a philosophical difference about the long run outcome and how to get there. I would rather trade draft picks from a weak draft for draft picks in a stronger draft. I just see using picks in a weak draft/late round picks, as wasting the pick; if you can make that pick a better pick in a stronger draft. Im all for this idea also. Ya know, its too bad we dont really know exactly how good this team would have been last year if Stafford stayed healthy. Would we be looking at this team and our needs differently? Its hard to say. But again, a 1st and 3rd for Prince...I'd do it (i think). If not, at 13 ill be more than happy with JJ Watt or Cam Jordan. I think that because this draft is so thin, if an opportunity presents itself to move up then we should take it. Whether it be Amukamara Peterson Bowers or Quinn if they slip. I'd rather have one impact player than 2 decent players. You guys are taking quantity over quality. So many holes. We could use quantity. Need LB's, CB's, 3rd receiver, at least one guard, and I would like another safety. Oh, almost forgot, need another RB too. I realize we can't plug all the holes with this draft. That being said, I do feel we can add several to the playing group. Maybe they turn out to be solid pro's, and maybe one turns out to be special. As for trading up for any of the players you mentioned, hope not. Don't think there's any more upside to Bowers or Quinn than Watt, Smith or Jordan. Amukamara and Peterson, I know all the hype on these guys makes them seem like immediate all-pro's. But be realistic, they will still be rookies. The best corner in last years draft wasn't taken till later in the 1st round.